Treasure Nile is an Ancient Egypt themed slot by Microgaming, featuring popular classic symbols, simple gameplay, and a progressive jackpot that could be all yours if you’re really lucky! With a very classic, bright look, you’ll be playing on 5 reels and 3 rows, on a total of 9 paylines. Wins pay both ways on Treasure Nile, so winning combinations count both from left to right and right to left! Treasure Nile is the right slot to play if you’re hunting the jackpot, but it still has a lot to offer in regular payouts as well, as you’ll soon find out. The RTP for Treasure Nile is 92.11%. The betting range for Treasure Nile is perfect for low-rollers who want a chance at hitting the jackpot without wagering very large amounts. You can play from € 0.5 per spin up to a maximum bet of € 4.5, which is still on the lower side. There are 10 regular symbols on Treasure Nile, including the head of Tutankhamun, a pyramid, the head of the god Anubis, the ankh symbol, an Egyptian necklace, a snake, a scroll, a column, and a few other Egyptian-themed symbols. The symbols capture the theme perfectly and there are no filler symbols; all symbols are true to the Ancient Egypt theme, giving this classic slot a truly authentic look. You’ll also see a sunset view of the pyramids, which is the wild symbol that substitutes all symbols except for the scarab beetle scatter. The only time a wild cannot substitute is in the progressive jackpot winning combination. There are no free spins in Treasure Nile, but you can keep your sight set on the progressive jackpot, the value of which starts at € 40,000 and goes up in value as the game progresses. You’ll see the value increasing above the reels! To hit the jackpot, you need five of a kind of Tutankhamun’s head landing on payline 9. You must be playing at the maximum bet of € 4.5 per spin in order to have a chance of winning the progressive jackpot on Treasure Nile. The progressive jackpot starts at € 40,000 and goes up in value as you play. Even if you don’t hit the jackpot, there are plenty of treasures and prizes to be found in the regular symbols on the paytable. Five of a kind of Tutankhamun’s head (landing on any payline except payline 9) will earn you a great prize of 6,000 coins. The pyramid symbol will earn you at least 20 coins and a maximum of 3,000 coins for a hit of five on a payline. The head of Anubis is also a very precious symbol, worth between 12 and 1,500 coins, while the ankh is worth a bit less at a minimum prize of 10 coins and a top payout of 1,000 coins. The medium value symbols are the intricate Egyptian necklace and the snake. The necklace is worth between 8 and 600 coins while the snake’s value is between 6 and 500 coins. 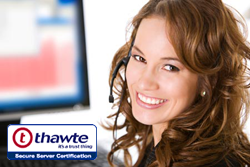 The lower win symbols are – starting with the highest paying symbol - the scroll, column, battleship, and wheat symbols. Prizes for these start from 1 coin up to 150 coins. The scarab scatter pays anywhere on the reels. Treasure Nile has simple, neat graphics that simply pop out of the screen. Set against a vibrant purple background, the reels are white scrolls with colourful symbols on them, designed in a cartoon style. Above the reels, you can see the ever-increasing value of the progressive jackpot. As you spin the reels, the sounds of a river flowing, birds chirping, and soft music is heard in the background to make the game even more enjoyable to play. Underneath the reels, you’ll find the game panel, from which you can set your bet and view the paytable as well. Treasure Nile is a simple game to play with a vibrant look and a lot of winning potential even if you’re not playing for the progressive jackpot on offer. 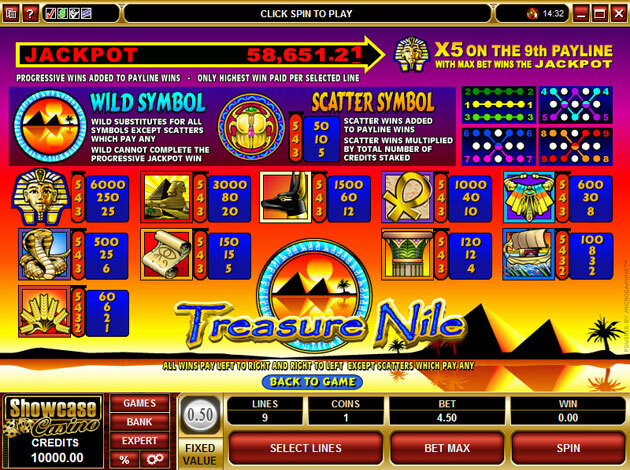 So, play Treasure Nile now at Videoslots.com to discover a flowing river of treasures! If you’re really lucky, the famous pharaoh might just be your lucky charm and earn you that jackpot.